“Who should I fight next?” Manny Pacquiao asked on Twitter last week. The list of options included some of the biggest names in the fight game. It did not, however, include the one person many around the boxing world wish for the man to step into the ring with. Floyd Mayweather, Keith Thurman, Danny Garcia, and Shawn Porter were all named as potential foes in Pacquiao’s poll. And the results ended up appearing in that order, with old foil Mayweather earning 73% of the vote. Keith Thurman earned 13%, while Garcia and Porter earned 9%, and 5% respectively. Missing from poll, though, was Errol Spence Jr., the undefeated IBF welterweight champ who recently invited Pacquiao into the ring with him after he beat Mikey Garcia in one sided fashion at AT&T Stadium outside of Dallas. Spence made it clear right then and there that he was eager to have Pacquiao as a foe. Pacquiao, mild mannered by nature, essentially said that sounded fine with him. The poll on Pacquiao’s Twitter page, however, told another story. Of course, it may well be the case that Pacquiao isn’t the person who actually created the poll. There’s no guarantee that he doesn’t allow people to post on his page. The wide consensus among fight fans and analysts is that Pacquiao’s best ring years are behind him. After a stunning rise into the mainstream with a defeat over Oscar De La Hoya in 2008, Pacquiao went on a tear, taking out big name after big name. Ricky Hatton, Miguel Cotto, Joshua Clottey, Antonio Margarito, Shane Mosely, and Juan Manuel Marquez all ended up earning losses against the fast fisted Filipino. 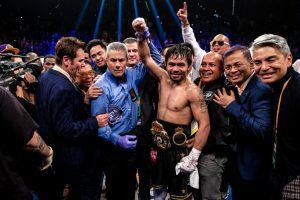 After being knocked out by Marquez in stunning and brutal fashion late in 2012, however, Pacquiao started to be regarded as being on the downside on his illustrious career. Even the 2015 superbout between Pacquiao and Mayweather was widely considered to have gone down years after it should have. Spence on the other hand, looks to be boxing’s future. A big, hard hitting welterweight, the Texan proved he was more than just a power puncher when he clearly outclassed the smaller Garcia in Dallas. Although he’s now bested big names like Garcia, and also former IBF champ Kell Brook, Spence has never met anyone with near the status of Pacquiao. Add in the fact that Spence has been seen as being avoided by his contemporaries, it’s little wonder why he’d want to get in the ring with a future Hall of Famer. Yet, having just beaten Adrien Broner in a successful pay per view event last January, Pacquiao isn’t viewed as an easy out for anyone.